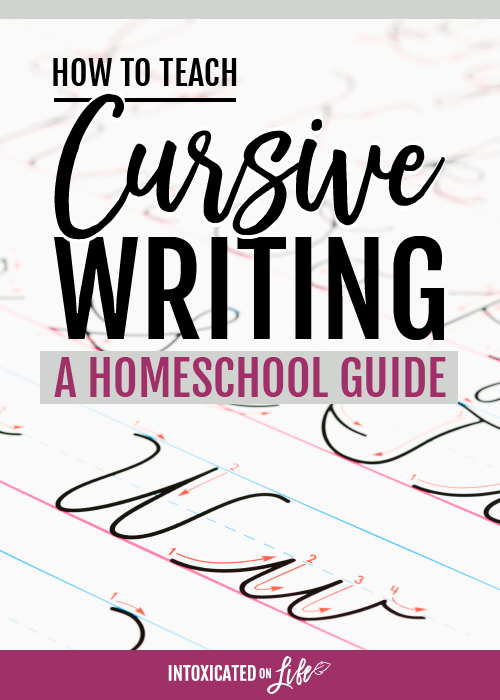 Do you teach cursive writing to your kids? While cursive may not be many people’s favorite school subject—it certainly isn’t mine—it sure is an important skill to learn. Someone with the ability to fluently write in cursive has a distinct advantage when it comes to note-taking and essay-writing. Cursive actually activates regions of the brain involved in working memory. 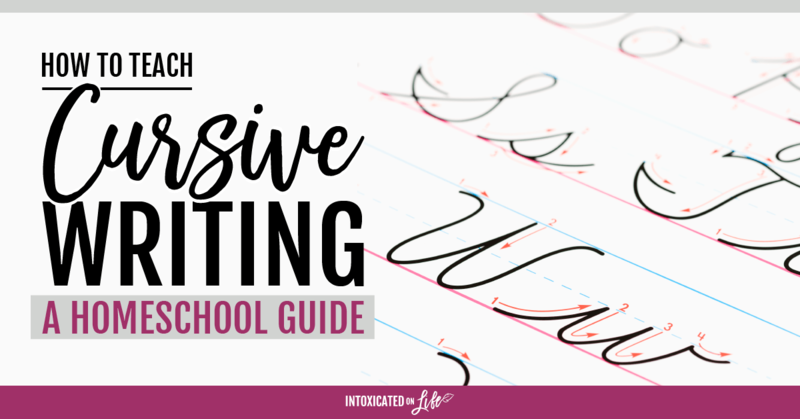 We teach cursive writing not because we love cursive but because we want our kiddos to love learning—and the ability to quick and legibly write is a good way to get there. We teach cursive not as an end in and of itself, but as a tool. While this might seem like a “no duh” kind of statement, there are a lot of parents who give their kids handwriting workbooks and just expect them to figure it out. While we all think our kids are smart cookies, assuming they can figure it out could lead to lots of improperly formed letters. Write them big. Big, oversized letters will be helpful for your students in visualizing how these letters should be written. They can even try writing them oversized a few times too! “Air write” the words. After writing the words big, have your students write the letter in the air, copying the strokes you used to write the letter. Use a white board. Let your students try their hand writing the letters on a write board before they move to paper. Whether it’s a large wall-mounted white board, or a small personal white board the letters will flow much more easily on a white board than on paper (I have one of these small double sided white boards for each of my kids, they come in handy for all sorts of things). Finger trace. 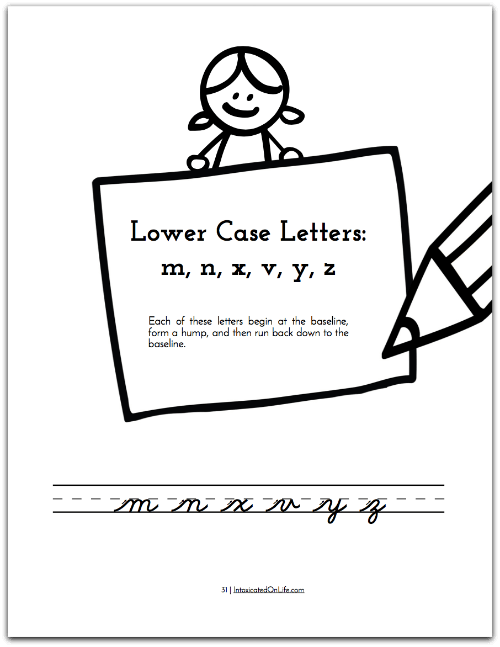 Have your student trace of the letter using their finger before writing it on their own. 2. Grouped letters by stroke. You’ve probably noticed a lot of cursive letters are formed very similarly. This comes in handy when you teach cursive writing to your kids. You’ll want to find the letters that are formed in a similar way, and present them in this order. Most books that focus on teaching kids cursive writing present the letters in this order, but there’s a few out there that don’t, so watch out for that when choosing a book. In Cursive Creations we present both lowercase and uppercase letters in groups. For instance, the letters “m, n, x, v, y, and z” all begin in a similar way. They begin at the baseline and form a hump at the midline, before coming back down to the baseline (see image below). Most upper and lower case letters can be grouped similarly. 3. Build on letters, don’t learn in isolation. With cursive, it’s especially important not to learn letters in isolation. As soon as a student knows at least 2 letters, they should be combining those letters. You see, a fundamental skill your kids are learning (that they didn’t learn when printing) is how to connect their letters when forming words. They don’t have to pick their pencil up between each and every word anymore! Continually help your student build on letters and don’t stop practicing previous letters they’ve used. With Cursive Creations we do this as soon as the second letter is learned. Students begin putting those letters together right away (see image below). Be sure your kids are getting plenty of practice with their letters. They should be practicing daily, but don’t require too much practice. Learning cursive can be hard work! Your kids are flexing their muscle memory, fine motor skills are being taxed, and depending on their age, attention spans may still be a little short. When it comes to learning skills like this, remember slow and steady wins the race. Consistency is the most important thing when learning cursive. 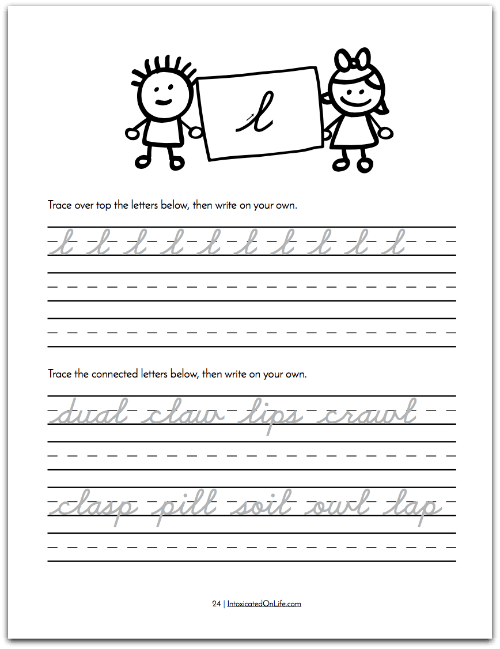 Have your kiddos practice their cursive a little bit each day. They’ll be able to work up to writing longer sentences and eventually paragraphs as they become familiar with all of the letters and their muscle memory improves. Let your children be the guide. In Cursive Creations I tell parent’s there is nothing wrong with just introducing one new letter per day, but if they’re excited and doing well introduce 2 or 3 letters a day. You can always slow down or speed up your progress as needed. 5. Don’t focus too much on neatness…at first. Don’t stress that each of the letters must be neat and perfect when just beginning. Instead focus your attention on correct letter formation—starting the letter in the right place, looping in the correct direction, retracing correctly, etc. Keep moving forward, teaching your student new letters even when it doesn’t all look perfect. I know this can be hard not to nitpick when letters dip above below the baseline or humps aren’t perfectly symmetrical. But don’t worry, neatness will eventually come, it doesn’t need to be the focus now. You’ll have time to work on that later! 6. 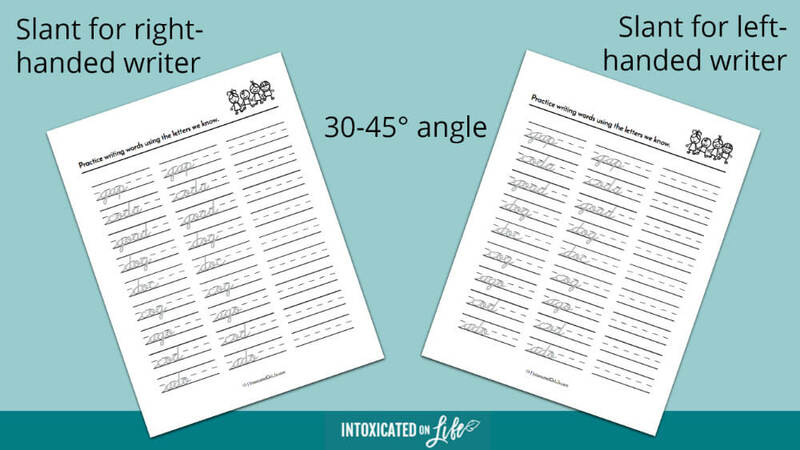 Be sure to angle paper correctly! Don’t let your kiddos keep paper or books straight in front of them. This will cause them to have a vertical script (with very few exceptions this is considered incorrect when writing cursive). Letters should be slanted up and to the right. But what if you have a lefty? Many consider lefties difficult to teach cursive to because of this slant, but it doesn’t have to be. I have two lefties of my own, and had to learn that, for lefties, we just need to be sure we’re slanting the paper the opposite way I would (see image below). 7. Don’t be afraid to deviate from plans. 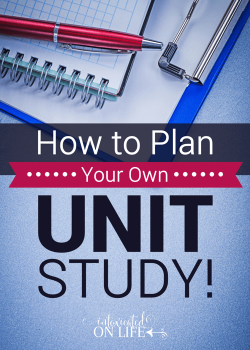 I’m a planner. I love making plans and I don’t like it when my plans get changed. 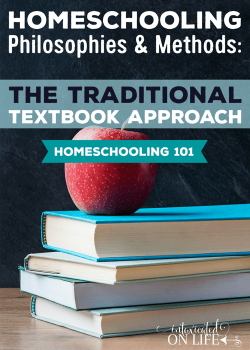 And then…I started homeschooling. 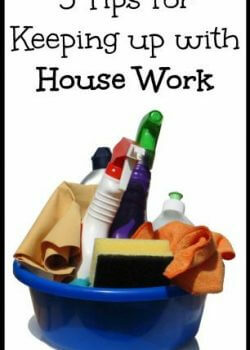 When you homeschool, you often learn that the saying is true: even the best laid plans of mice and men often go awry! 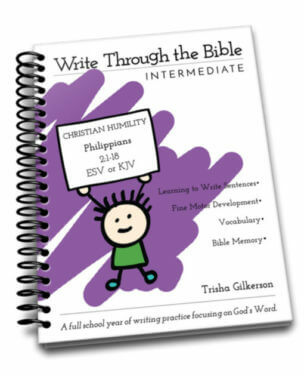 Maybe you planned to teach cursive writing and have completed your cursive workbook and have of all the foundation laid in 8 weeks. But your little munchkin is struggling and can’t keep up the pace you had hoped. Don’t worry, just move a little slower. Maybe there’s something your kiddo really really wants to learn? Maybe they want to learn how to spell their name in cursive. Now worries, go ahead and skip forward and teach them. It’s always great to engage kids in what interests them! It makes the learning process more fun for them and in turn for you too. If you need a short workbook (typically takes 8-12 weeks) that walks students through exactly how to create cursive letters and connect them together, Cursive Creations: A Beginner’s Guide to Handwriting is for you. 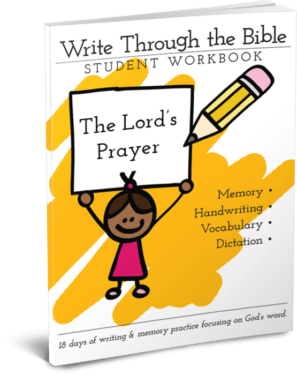 Helping Your Kids Know God’s Word: What’s Handwriting Got to Do With It? I have what I think is probably an unusual question. We have always homeschooled and our now-12-year old was resistant to being taught handwriting when she was younger – she was making letter shapes at 4-5 but typical teaching methods didn’t work with her. She is bright and headstrong and she really didn’t want to do letter tracing (she turned it into art and drawing) but preferred to figure it out herself. Due to some chronic health issues I was suffering at the time, I had limited energy and didn’t know a way to teach her properly how to form her letters. She has decent printing now if she takes her time but no cursive – her idea of trying to imitate this has been to make curly loops on the ends of all the letter strokes which isn’t really very readable. In any case, we both now agree she should learn to write properly and she says she would like to (she wants to have pretty handwriting). 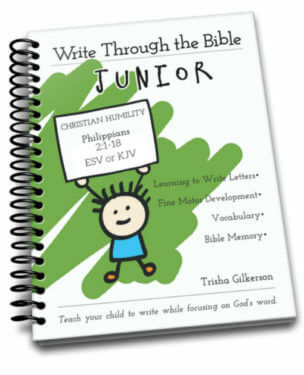 We had chosen Italic writing books (though it seems very daunting to me when I consider trying to teach from them!) because I think that style of printing and writing is clear and attractive and should be easiest to master. However, since she is almost 13 most or all of the cursive writing “helps” and potential copywork I’ve seen are simply not age appropriate. We also have “Spelling You See” which might be acceptable subject matter but it’s not italic-based. I feel at a loss about what to do next to get started. If it’s too time-consuming or tedious I don’t believe we will get very far. We have a busy schedule and several more challenging topics to focus on such as the 2nd year of Lost Tools of Writing level 1, science, intro to logic and more. 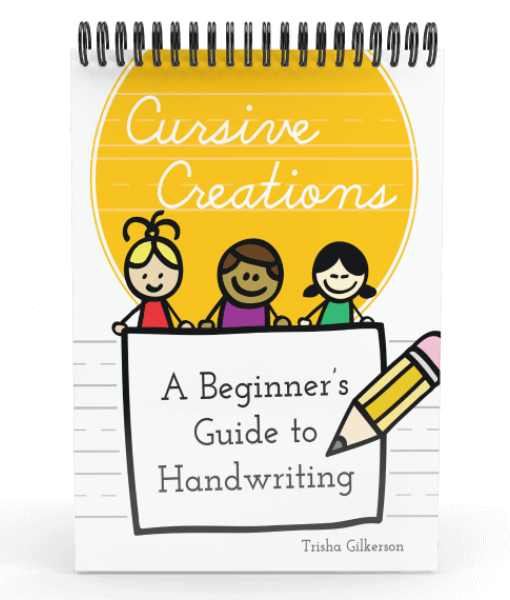 Do you have any suggestions on teaching cursive to older students that may help us succeed? Thank you in advance! I think you hit the nail on the head. Whatever you decide to do needs to be doable and easy to implement. I don’t have specific resources I can point you in the direction of for older kids because I’ve not had to look for them myself, but I know they’re out there (maybe another reader will chime in if they do know of something). I really think something basic, that just teaches the letter strokes and begins combining letters right away and follows a lot of the strategies I laid out here is what your daughter needs. 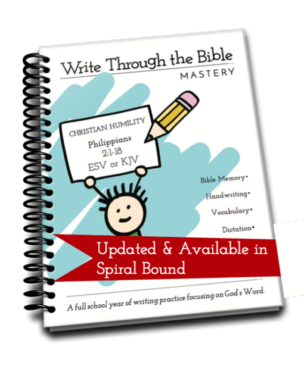 The process for learning cursive at 13 doesn’t need to be any different than how an 8 year old would learn. Did you find something for your daughter? If not, I highly recommend Cursive Logic. It’s straightforward and makes it so easy to learn! The lady developed the program to teach a 23 year old who wanted to write his name in cursive. Great article! I’m focusing on cursive this year — but it’s “something your kiddo really really wants to learn” focused and that means dragons!